This article describes the Viable System Model, developed by Anthony Stafford Beer in a practical way. After reading you will understand the definition and basics of this powerful management tool. What is the Viable System Model? The British psychologist Anthony Stafford Beer is the founder of the Viable System Model (VSM). He describes this model in his 1972 book ‘Brain of the Firm’, which is a management tool to determine the viability of an organisation. With this model, it becomes clear whether an organisation has a chance of survival in a rapidly changing market and environment. It is also applicable to every healthy and viable organisation, and relevant to both individuals and teams. With the Viable System Model, it is possible to look at the internal and external balance of an organisation and bring the smallest detail to light. Different subsystems are scrutinised and improvements are applied where necessary. As a result, an organisation will be profitable (viable) again. The Viable System Model considers organisations as a complete system, which must be in balance with their environment. It is essential for every viable organisation to monitor this balance. When there is imbalance, the organisation cannot possibly remain profitable. The world around us is changing rapidly and old organisational structures and management theories are becoming increasingly outdated. Many organisations have built their hierarchical structure according to the classic ‘rake model’, in which control and direction come from the top. This ensures that everything is built on a solid foundation and makes it so that organisations cannot always respond quickly or with the necessary flexibility to changes. It doesn’t so much matter how the hierarchy is set up, but it is more about who talks to whom within all layers of the organisation. According to the VSM, there should be a flat, self-organising organisational structure that ensures that changes can be made quickly and easily. Mutual communication leads to cooperation, synergy and flexibility. According to the Viable System Model, one of the most important characteristics of successful organisations is that they are able to adapt to their changing environment. Anthony Stafford Beer also used nature as a source of inspiration for the Viable System Model, including the human brain and nervous system. He was interested in finding out what was the minimum requirement was for the (human) system to be able to function independently and survive. He linked this to any arbitrary system, such as an organism, a city or an organisation. The way in which the human brain allows muscles and organs to function is a nice metaphor for, for example, the business world. From this comparison, he developed 5 subsystems, each with their own role but working closely with each other. These subsystems are the basis of the VSM. The first three systems relate to the current activities of the organisation. The fourth system focuses on future effects of external changes and demands that weigh on the organisation. The fifth system keeps the balance between both the current activities as well as future external changes and focuses on the viability of the organisation. Looking at it as part of the human body, this is all muscles and organs. These are the basic activities of each system, which actually do something. Every other viable system contains several similar primary activities. For example, the primary activities of an organisation focus on the development and delivery of its products and/or services, with each activity adding a value. Various departments are created each with their own role in this process. As seen from the human body, this is the autonomic nervous system, which monitors the internal stability of each system. In the context of an organisation, this system represents the channels of information, which connects the primary activities together and enables communication. Together they should be able to achieve a good and desirable result. It’s all about coordination and communication. This means adequate and useful agreements should be made amongst each other. The processes that are set up should mainly be there to serve, and not to lead. When the circumstances require so, they should be adjusted immediately. Within the human body, this is the cerebellum. This oversees the entire complex of muscles and organs and ensures cooperation and optimal performance with regards to internal housekeeping. It’s all about control and optimisation of the entire organisation. When this doesn’t happen, it may occur that units start working solo, which results in departments no longer cooperating with each other and merely working in their own interest. The metaphor of the human body makes this clear – a muscle can optimise itself. However, when a muscle become too strong, then the bone to which the muscle is attached will break. This is why muscles and bones need to be in proportion to each other and become more optimal together for the best result. This is also true for organisations. Basically there must be mutual trust and all employees must strive towards the organisation’s joint goal. This is about the midbrain of the human body, connected to the outside world through the senses. This creates adaptability, innovation and future plans from an organisation. It allows contact with the outside world and adapting to this is what ensures an organisation’s survival. It’s about the intelligence of an organisation. Organisation are not an island, but work in specific environments that can sometimes change drastically. This is why it’s important that organisations keep a close eye on their environment, so that they can respond to these changes in a timely manner. This also means that trends, technological developments and other changes in the market must be followed closely. Organisations must continuously ask themselves what such changes will mean for their strategy and adapt accordingly. An organisation is then capable of keeping itself under control and going with the flow. These are the higher brain functions of man, where consciousness and identity are hidden. The parallel in organisations can be considered the formulation of the policy and the choice of the direction in which the organisation wants to go. It comes down to the responsibility for making policy decisions within organisations. The basis must always be kept in mind, what the basis of existence is; the core business of every organisation. Organisations have to selectively sort through the large amount of information that comes from both outside the organisation as well as from within. By knowing in advance and describing the mission, vision, norms and values within an organisation, it will be easier to draw up specific selection criteria. Which information is relevant and which isn’t? The Viable System Model can only work when the company goal is clear and everyone knows what is necessary to achieve this goal. Additionally, a maximum amount of autonomy is beneficial so it’s clear who is responsible for which decisions. Therefore, operational departments should not work autonomously, but look for cooperation with other units. After all, they are all part of a larger system. This is why it is, on the one hand, advisable for each department to account separately for their contribution to the larger whole. On the other hand, departments should accept that when the viability of the larger system is threatened, their autonomy will be temporarily limited. As Anthony Stafford Beer states, a living system has no hierarchy and the communication between parts never runs as one-way traffic; it is a closed circular system. Every organisation that adheres to the aforementioned natural principles can better adapt to a rapidly changing environment. What do you think? 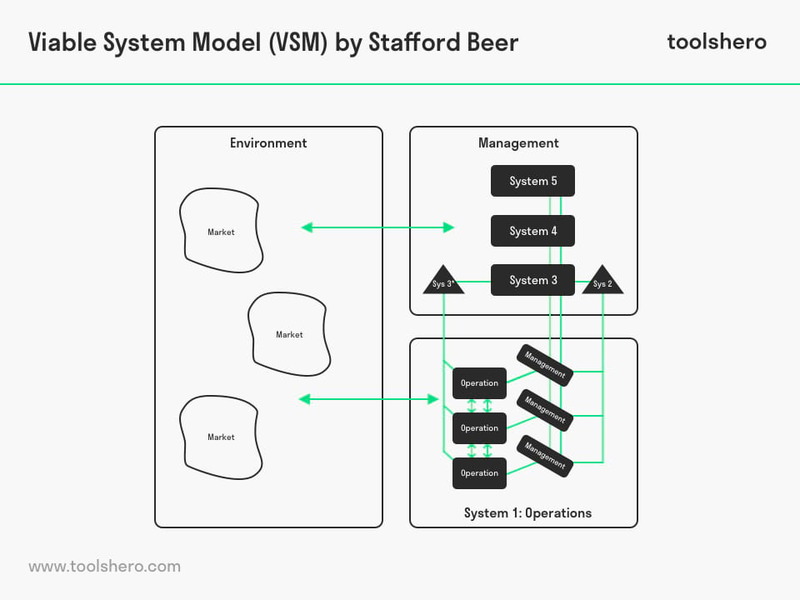 What is your experience with the Viable System Model (VSM)? Do you recognize the practical explanation or do you have more additions? What are your success factors for setting up a good organisation management strategy? Beer, S. (1972). Brain of the firm: A Development in Management Cybernetics. New York, NY: Herder and Herder. Beer, S. (1984). The viable system model: Its provenance, development, methodology and pathology. Journal of the operational research society, 35(1), 7-25. Espejo, R., & Reyes, A. (2011). Organizational systems: Managing complexity with the viable system model. Springer Science & Business Media.